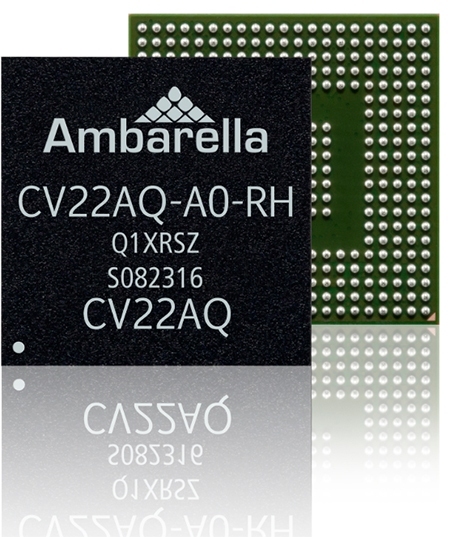 Ambarella Inc. and Smart Eye are developing a driver and cabin monitoring system for Ambrella’s CV22AQ CVflow computer vision processor. // Photograph Courtesy of Ambarella Inc.
Smart Eye, a developer of artificial intelligence (AI)-powered eye, mouth, and head tracking technology with its U.S. office in Bloomfield Hills, and Ambarella Inc., a California-based developer of high-resolution video processing and computer vision semiconductors, today announced they will partner to deliver a driver monitoring system platform that tracks driver actions and intentions. The platform is based on Ambarella’s CV22AQ CVflow computer vision processor, which will have Smart Eye AI software, making it possible for automotive OEMs and Tier 1 suppliers to deploy driver and in-cabin monitoring systems with advanced AI features. The system is designed to increase safety and convenience for drivers and passengers. The system enables high-accuracy detection and monitoring, even in low-light in-cabin environments. Its HDR processing extracts maximum image detail in high-contrast scenes, further enhancing the computer vision capabilities of the chip and performance potential of Smart Eye algorithms. The computer vision processor also includes a suite of security features to protect against hacking. Smart Eye’s global headquarters are in Sweden. Its solutions are used by the U.S. Air Force, NASA, BMW, Lockheed Martin, Audi, Boeing, Volvo, General Motors Co., and more. Abarella’s products are used in surveillance, electronic mirror, drive recorder, autonomous driving, and robotic applications, as well as advanced driver assistance systems and driver and cabin monitoring.